Assistant Manager Career in IDBI Bank Career | Current Openings - IDBI Bank Ltd. NOTIFICATION: Industrial Development Bank of India (IDBI) Mumbai (A Government of India Undertaking) inviting online applications for filling up 500 vacant posts of Assistant Managers at its different Branches and Offices on direct recruitment basis from eligible and interested willing candidates. It is latest & good information for unemployed personnel those who are looking for these new Jobs in Government sector & other organizations. Job seekers, who wish to apply for these vacancies regarding IDBI Recruitment 2019, must have passed Graduate in any discipline from any recognized University with minimum 60% marks (55% for SC/ST/PWD) with a required experience if asked. Applicant’s upper age should be as per Govt. rules and age relaxation is applicable to all reserved category candidates i.e.SC/ST/OBC /PWH/ Ex Servicemen /Women candidates etc. NO OF VACANCIES: 500 vacant posts of Assistant Manager at its different Branches and Offices in Industrial Development Bank of India (IDBI). EDUCATIONAL QUALIFICATION: A passed of Graduate in any discipline from any recognized University with minimum 60% marks (55% for SC/ST/PWD)/ Degree (Graduation) in any discipline from any University recognized by the Govt. of India OR any equivalent qualification recognized as such by the Central Government. Computer Proficiency: Applicants are expected to have proficiency in Computers. AGE LIMIT: Candidate’s required age should be in between of 21 years to 28 years as on 01-03-2019 i.e. a candidate must have been born not earlier than 02.03.1991 and not later than 01.03.1998 (both dates inclusive) for IDBI Bank 2019 Notification for 500 Assistant Manager Posts. PAY SCALE: Pay & Allowance - The total salary comprises of basic pay plus such other allowances, as admissible to the officers from time to time. The extant basic pay applicable to Assistant Managers in Grade 'A' is Rs.23700/- per month in the pay scale of Rs.23700-980(7)-30560-1145(2)-32850-1310(7)-42020(17 years) [Pre-revised]. The candidate will also be entitled to such other perquisites/facilities/ benefits, etc. admissible to Assistant Managers in Grade 'A'. The pay scale, allowances, reimbursements, perquisites and other terms subsisting at the time of joining and as may be modified / amended / revised from time to time would be applicable. The gross salary for the post of Assistant Manager (Grade A) at metro center is Rs.60000/- p.m. (approx.). REQUIRED APPLICATION FEE: For said vacancy a non- refundable application fee is to be paid by the candidates as per rules. An amount of Rs.700/- by General & OBC category candidates and Rs.150/- by SC/ST/PWD candidates to be paid through online mode through Online payment gateway using Debit Cards (RuPay/ Visa/ MasterCard/ Maestro), Credit Cards, Internet Banking, IMPS, Cash Cards/ Mobile Wallets. NOTE: Bank Transaction charges / convenience charges for Online Payment of application fee/Intimation charges will have to be borne by the candidate. Pre-Examination training (PET) for SC/ST/OBC applicants: (i) In compliance with Government Guidelines, IDBI Bank would arrange free non- residential pre-recruitment training for interested eligible SC/ST/OBC applicants for 6 days from 07.05.2019 to 13.05.2019 (May 12, 2019 being holiday due to Sunday/ election day) prior to the written test. The PET will be organized at Ahmedabad, Amritsar, Bhopal, Bengaluru, Belgaum, Bhubaneswar, Coimbatore, Chennai, Chandigarh, Delhi – NCR, Guwahati, Gwalior, Hyderabad, Jaipur, Kanpur, Kolkata, Kochi, Lucknow, Madurai, Mangalore, Mumbai, Nagpur, Patna, Pune, Raipur, Rajkot, Ranchi, Thiruvananthapuram, Vijayawada and Vishakhapatnam. IDBI Bank has discretion to add or delete the centers in respect of pre- recruitment training. Applicants who desire to avail of such training may indicate the same at the appropriate place in the application form. The applicants will have to make their own arrangements for travel and stay and meet all expenses. The pre examination training will not confer on the applicants any right of recruitment in IDBI Bank. SELECTION PROCESS: Applicants who are screened for applicability/ eligibility are being selected as per organization policy/rules depending on the basis of their performance in Online Test followed by personal interview. Tentative Date of Online Test: May 17, 2019. HOW TO APPLY: For said posts (IDBI Bank Recruitment 2019 Apply Online 500 Assistant Manager Posts) eligible, willing and interested candidates may apply through online at official website up to last date. Applicants must retain a hard copy for future reference. स्टेट बैंक ऑफ इंडिया ने प्रोबेसनरी अधिकारी के 2000 पदों को भरने के लिए एक विज्ञापन प्रकाशित किया है। इच्छुक एवं योग्य उम्मीदार यहाँ आवेदन कर सकते हैं आवेदन पूर्व सभी आवश्यक जानकारी यहाँ से प्राप्त करें। 2000 vacant posts of Probationary Officer (PO) in State Bank of India (SBI). LAST DATE TO APPLY: 22-04-2019. (b) You can also click on given below link for apply. (c) Click on “career” option. (d) Click on Recruitment of Assistant Manager -2019. (e) Click on “Apply Online”. (f) First, register yourself by clicking “Click here for New Registration”. (g) Fill in the details such as Name, contact number, and Email-id. (h) Login with system generated login id and password. (i) Fill in all the details carefully. (j) Upload Photograph and Signature. (k) Make Payment of fee through Online Mode Only. (l) Take a printout of application form and Preserve the e-Receipt for submission during the time of document verification & pre-recruitment medical test. The hard copy is not to be sent to the bank. CONTACT ADDRESS: Industrial Development Bank of India (IDBI Bank), IDBI Tower, WTC Complex, Cutffe Parade, Mumbai- 400005. CONCLUSION: Industrial Development Bank of India (IDBI) Mumbai invites online application for the recruitment of 500 vacant posts of Assistant Managers from Indian residents who are eligible & interested; candidates can apply through online application. 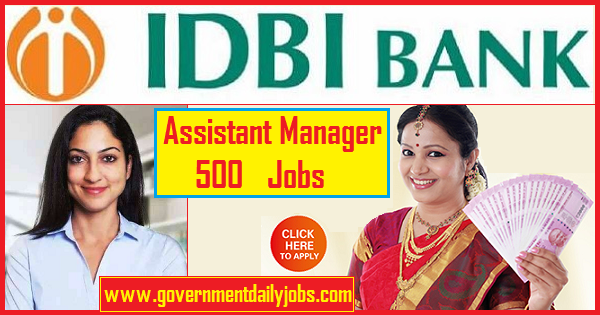 LAST DATE TO APPLY: 15-04-2019 for IDBI Bank Assistant Manager Recruitment 2019 Apply Now for 500 Jobs.